Then Capt. Morgan was 24 years of age when in command of the Memphis Belle. After reaching the rank of Lt. Col., he led the very first B-29 formation over Tokyo. Lives in Ashvielle, NC. From Flint Michigan, he retired as a teacher and conselor. He saved the Belle and more B-17’s after identifying false German radio beacons designed to lure unwary B-17s into harms way. Hollywood writer for Bogart, freind of Ronald Reagan, Jimmy Stewart, June Allyson. Restaurant operator, race car driver. Completed 2dn tour of duty aboard B-29 with Morgan in the Pacific. Died in 1980’s by an aircraft crash. Transferred to 306th BG after flying raids 1,2,3 & 5 aboard the Belle. On mission 3, he was shot in the leg and bandaged by Fred Astaire’s sister. He never reported the injury. From Johnson City, TN. He flew on the 4th and on missions 6-10. Suffered severe frostbite on #10. Retired rank of Major. Gunnery Specialist on B-17’s, B-29’S, B-36’s, and B-50’s. From Green Bay, WI. His first raid aboard the Belle was 14 Feb. 1943 to Hamm, Germany. A former building contractor and records regristar today he is active in real estate. Became a regular member of the crew during training at Walla Walla, WA in 1941. Retired from the fodd distribution. Lives today in Mesa, AZ. Still has bullet-ridden log book. From Arapahoe, NC. “From down there I could see everything”. He fired at a great many German fighters and achieved one “Damaged” credit. Retired from Ford Motors Company after 30 years. From Kingwood, WV. He was called “The Lost Crewman”, because he dropped out of sight after the war. He flew 15 missions aboard the Belle but missed the “tour” because he hadn’t flown 25 yet. From Apache Junction, AZ. Nastal flew one mission on the Belle. He had 24 raids on other forts. After the “tour”, Tony decided to go back to Europe and completed sixty missions. Was his guns that downed the 8th and final German fighter from the Belle. And his diaries that provided most of the accurate accounts of the missions. Retired as a chemical engineer. After the “tour”, he tried in vain to fly with Morgan in the Pacific. Was assigned to CBI theatre and downed 3 Zeros before his B-29 was shot down. He bagged 2 German fighters from the Belle’s tail. He kept the Belle Flying through six month of combat. Replaced 9 engines, both wings, two tails, both main landing gear, and more! From Hulneville, PA. He retired as Construction Co. Office Manager. The subject of the affections of Capt. Robert K. Morgan. 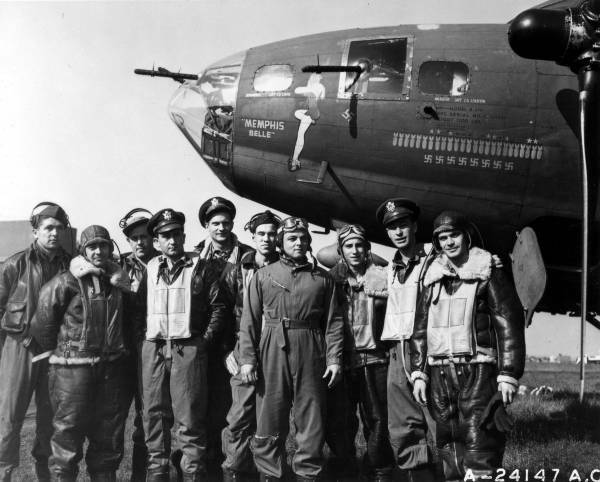 It was Margaret for which Army 41-24485 was named “The Memphis Belle”. She helped in fund raising for the Association until her death.